St. Francis Xavier brought more than 30,000 souls into the Faith. 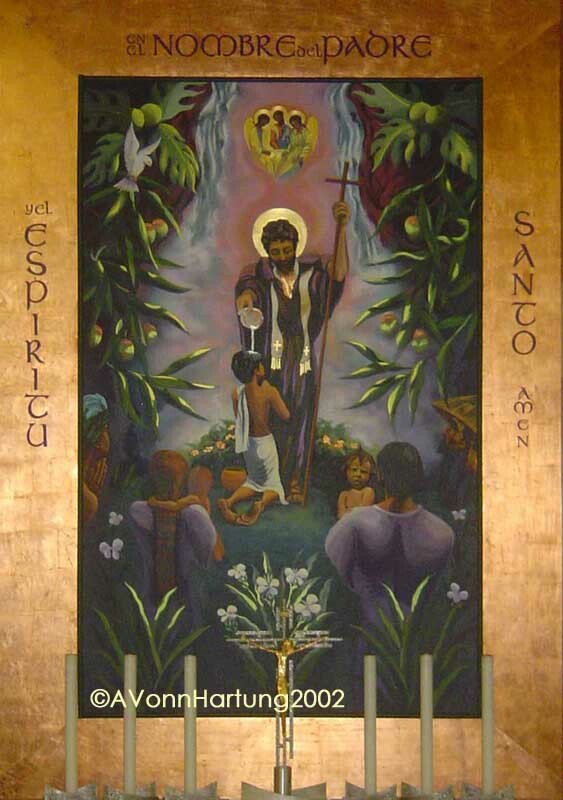 Known as the “Apostle of the Indies” and “Apostle of Japan”, he is said to have converted more people than anyone else has done since Saint Paul. 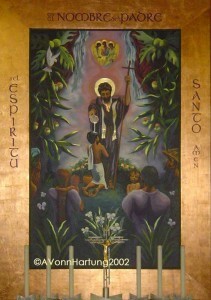 This Painting/Retablo was commissioned by Padre Julio Victor García in 2002 for Iglesia San Francisco Javier (Trujillo Alto, Puerto Rico). It measures 6 feet in width by 11 feet in height and is my original design, built from solid mahogany, painted in acrylic and gilded with gold and copper leaf. The vertical format symbolizes this world, our Church and the witness of the life and evangelizing work of San Francisco Javier. The frame, through its striking presence displays the Sign of the Cross with which we as Christians identify ourselves in and through Baptism. It represents the tireless work of St. Francis, from sunrise to sunset, and the eternal truth, the Alpha and Omega of Christ. It acts as a window through which we enter to find further truths. St. Francis Xavier is portrayed baptizing a youth who symbolizes the future church whose people are seen coming to the Faith. The Holy Family is represented by any and all who do the Will of the Father in bringing young souls to be saved. The Children brought forth by their Godparents engage us in reflection and contemplative prayer. The Background: Surrounding this cascade of divinity with its luminous light and vapors, are luxurious examples of Holy Creation as expressed in the abundance of nature – by the breadfruit and mango trees, symbolizing Love, Beauty and Resurrection, and by the depiction of the dove which is drawn closer, and the serpent which is driven away. Gregory Burch on Welcome! Bienvenidos! 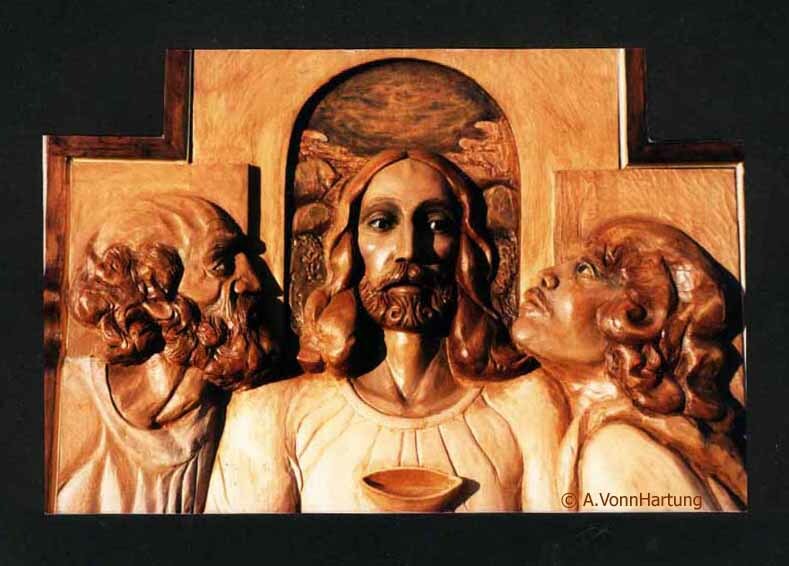 Copyright © 2014-2019 A.Vonn Hartung. All Rights Reserved.